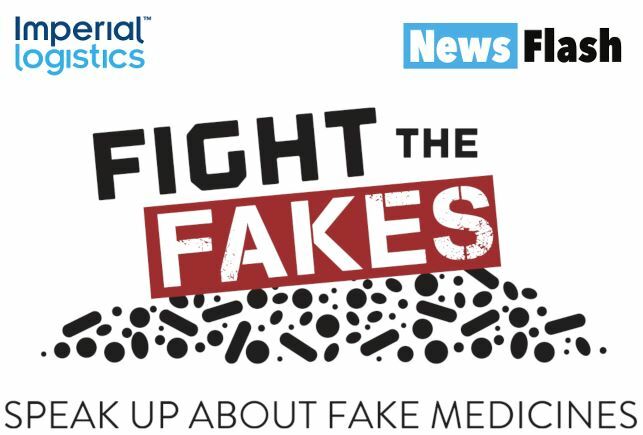 Monday, 3 December to Friday, 7 December 2018 is Fight the Fakes week which aims to raise awareness about the dangers of fake medicine and gives a voice to those who have been impacted. According to new data published by the World Health Organisation (WHO), one in ten medical products circulating in low and middle-income countries is either substandard or falsified. It estimates that 72 000 to 169 000 children may die each year from pneumonia due to substandard and falsified antibiotics. As a leading force in African healthcare supply chain management, as well as pharmaceutical wholesale and distribution, Imperial Logistics is committed to addressing the public health threats that stem from fake medicines. The company recently added impetus to its efforts by joining forces with global action campaign “Fight the Fakes” through its relationship with IFPW, the global trade association for pharmaceutical wholesalers and distributors. The WHO reports showing that all disease areas are impacted by falsified medicines, with antimalarials and antibiotics being the most commonly reported. The majority of substandard and falsified medicines (42%) stem from sub-Saharan Africa, followed by 21% from the Americas and 21% from the European region, the reports reveal. They note, however, that this is just the tip of the iceberg, since, given patchy reporting, it is highly likely that these figures represent just a small proportion of the problem. Nearly any type of pharmaceutical product can be and has been falsified: whether ‘lifestyle’ medicines, including erectile dysfunction and weight loss medicines, or lifesaving medicines, including those used to treat malaria, tuberculosis, HIV/AIDS, cancer, heart disease, diabetes and other life-threatening conditions. More than 500 fake versions of pharmaceutical products are currently circulating. Some estimates put the number of deaths by falsified medicines at 700 000 per year. In addition, online sale of medicines is an increasing international threat, as there are more than 40,000 “active rogue online pharmacies” at active at any one time. “As a global campaign that unites partners active along the supply chain, and that provides accurate information on the risks of falsified medicines, Fight the Fakes supports the WHO and others by explaining how to avoid fakes, how to spot them and how to report suspicious products,” Rossouw expands. “The campaign gives a voice to those who have been personally impacted and shares the stories of those working to put a stop to this threat to public health. It is building a global movement of organisations and individuals who will shine a light on the negative impact that fake medicines have on people around the globe and will work together to reduce the negative consequences on individuals worldwide. Fake medicines are everybody’s business, and a comprehensive strategy to combat the manufacturing and distribution of fake medicines requires active participation by all stakeholders,” he concludes.